The integration of mobile money into microfinance operations is one of the most exciting yet challenging prospects facing microfinance providers today. Mobile money presents a fast, cost-efficient and flexible alternative delivery channel through which money can be transferred, loans can be repaid and savings can be deposited. Yet, globally, active usage of mobile money on a 90-day basis remains low, at around 33 per cent. BRAC has been gradually integrating mobile money into its microfinance operations since 2011. Among many of its microfinance clients, who are predominantly poor rural women, the prospect of transacting with money via mobile phone instead of cash, at first seems suspicious and daunting. In seeking to promote responsible, confident and active use of its financial services, BRAC has introduced a number of initiatives. These have included investing heavily in client protection, customer service and financial education and developing mobile money use cases that made sense to the average microfinance client, such as using mobile money to pay deposits into monthly savings schemes. 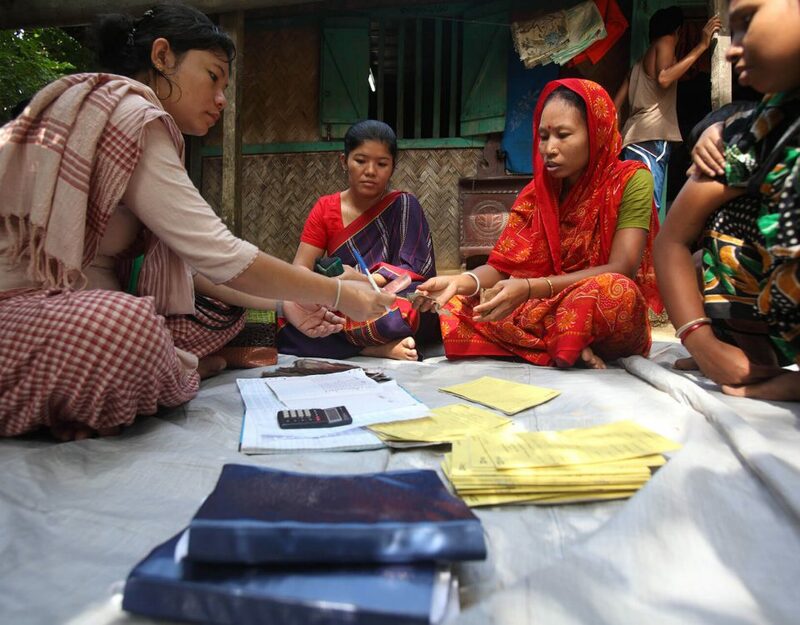 As part of FI2020 Week, which this year puts the spotlight on keeping clients first in a digital world, we spoke to one of BRAC’s clients about her experience using mobile money in microfinance. A client for more than 10 years, Maloti Rani Das has witnessed several key changes that have in turn changed her experience and view of microfinance. In a brief one-on-one interview, she took us through her journey with BRAC, from why she borrowed her first loan, her feelings when she first started using mobile money, and what has helped her become a confident user. 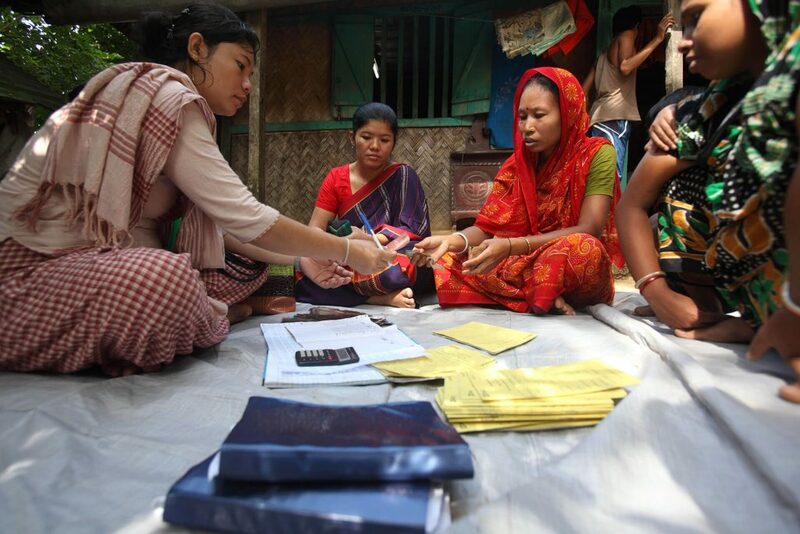 Maloti is one of BRAC’s 5 million microfinance clients in Bangladesh. She is a housewife and lives in the suburbs of Manikganj with her husband, two children and in-laws. She has been married for 13 years to Nikhil Das, a carpenter by profession who owns a stake in a local wood business. She told us how her hands trembled when she borrowed her first loan of 5,000 taka (USD 64) more than 10 years ago. 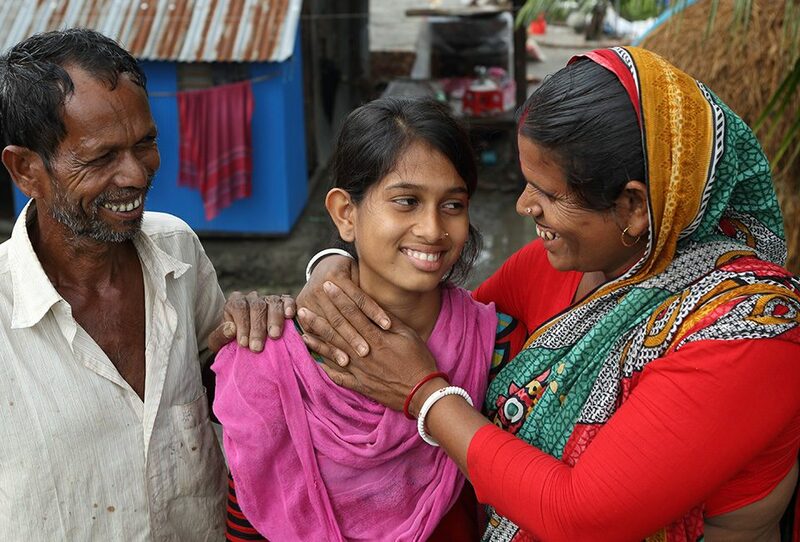 We spoke to Maloti at one of BRAC’s branch offices in Manikganj, her daughter by her side, trying to hide behind the anchal (or end) of her saree. BRAC: Tell us your story. How did you first get involved with BRAC? Maloti Rani Das: I used to be a good student. But when I was in class 10 my parents got me married. After that, to earn a living I would teach school children. Within two years my son was born. Leaving work wasn’t really a choice for me given how much responsibility I had, and with my failing health (heart problems, high blood pressure) we needed the extra money. As my son got older, my husband and I felt the need for some additional earnings. We needed some cash to invest in our wood business. That’s when I heard about BRAC from a neighbour. They said it was big and that it was legal, unlike the rest (of the lenders) we knew of. We had heard about this other bank that had run away with people’s money. It was hard in those days. It took a lot of courage for me to go and get my first loan from BRAC. Our business was going quite well. Around this time my daughter was born and I decided to open my first deposit pension scheme (DPS) with a monthly commitment of 100 taka (USD 1.30) so I could save up for her. As the business did better, we repaid the loan, and within a few months I borrowed a larger amount. Today I have a loan of 20,000 taka (USD 255) from BRAC. BRAC: So you have been a client of BRAC’s for quite some time. Have you seen any changes made within the organisation? Das: Yes, of course. Back in those days, I had to come to the branch office each month to deposit my savings. Now I use bKash and I can send the deposits through my mobile phone. BRAC: What do you think about using bKash? Is it very new for you? Das: I’m quite confident now. I’d be lying if I didn’t admit that this wasn’t the case when I started! I was very scared and unsure of using bKash when we were first trained. But gradually we got used to it. Liza apa (a customer service assistant, or CSA, based at the local branch) helped me learn how to use bKash and helped me understand the benefits of using it. bKash has made it easier for me than it was before. I don’t have to travel to the BRAC branch office anymore to pay deposits. Previously, I’d spend 50 taka (USD 65 cents) to come to BRAC and make a deposit of 100 taka (USD 1.30). Now as I make the payment using bKash, it saves both my time and money. It makes sense. BRAC: Do you use bKash for any other purpose than paying the deposits? Das: Yes, I do. My account is the only bKash account of the house. I use it to recharge my phone balance, and I have sent money to a couple of my neighbours and relatives. In fact, my husband uses my account for his business transactions as well. And my brothers sometimes send me money from Dhaka when we are in urgent need of cash. BRAC: We all face problems at some point using mobile money. Sometimes the network is down, sometimes we mess up the options. Some people even have a hard time remembering their PIN. Do you ever face these problems? What do you do in those circumstances? Das: Oh yes. In fact, the first few times it was nerve-wrecking! I could feel my blood pressure rise every time I did a transaction. But Ananta da (a BRAC field officer) helped me a lot. He helped me learn and become confident. And now that Liza apa is there I can call her any time I need to. BRAC: It seems you have a good relationship with BRAC staff. Has that always been the case? Das: Different staff have come and gone. And they were all nice, but to be honest back in those days we did not have as strong of a relationship with staff. We didn’t really have a clear picture about all of BRAC’s services and relied more on assumption. But now since Liza apa joined, she’s just a phone call away. This is something we could not imagine at that time. She gives us time, she shares information, motivates us; most importantly, she even gives us reminders over the phone. In fact, just this month I missed the deposit deadline. Liza apa called to remind me about it. So yes, we all can feel the difference I think. BRAC: What problems did you face before Liza apa was appointed? Das: Well, many of us are not that (financially) aware. Even the simple fact that you shouldn’t send other people to pay your loan instalments for you is something that most people from my village wouldn’t understand. There were many in my community who didn’t know how to put their money to best use, and it was common for people to borrow from multiple microfinance institutions. For example, there was one time where I used my friend’s help to transfer some cash, and the friend turned out to be a fraud. These things do happen. My husband was very angry, we had a big fight. After Liza apa joined, she talked to us about such occurrences. She guides new clients, orients us on disbursement-related issues and provides training on financial literacy. Very recently she has also started doing bKash registrations for BRAC microfinance clients. We all have her number. If we face any problem, we call her and she tries her best to solve it. BRAC: Are you satisfied with the services BRAC provides? What other things could BRAC do to make your experience better? Das: I heard BRAC CSAs are now also serving as bKash agents. This is a good initiative. Everything in Bangladesh seems to be going digital nowadays, but it hasn’t reached everyone equally. I think BRAC can take initiatives to help everyone be a part of this big change! BRAC’s approach to integrating mobile money into its systems has been to provide significant investment upfront — for instance, in customer service and piloting project — in order to gain from the efficiencies of using mobile money in the long term. This has worked well for Maloti and thousands of other microfinance clients, but it remains a challenge for many, especially older women. As BRAC scales integration of mobile money to all 2,000 of its branches nationwide this year, we would love to hear from others about what has worked well in helping their clients use mobile money. Write to the BRAC Social Innovation Lab at sil@brac.net or comment below. Tanjilut Tasnuba is team leader and Masrura Oishi is knowledge management and communications officer at the BRAC Social Innovation Lab; Isabel Whisson is a deputy manager at BRAC Microfinance and Targeting the Ultra Poor programmes.